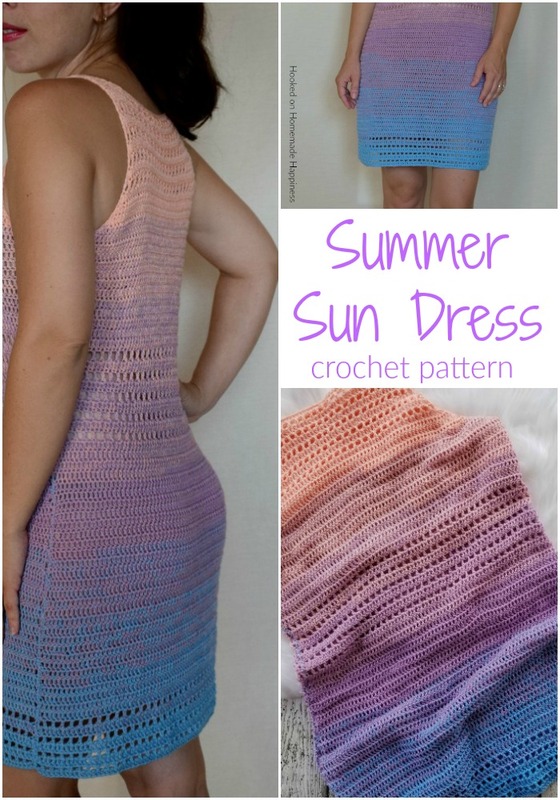 Making this Crochet Sun Dress Pattern is perfect for the summer heat because it is SO light weight. You won’t believe how comfortable it is for summer. Also, making this dress is easier than you might think. It’s 2 stitches & 2 sides sewn together (with a little bit of shaping). Grab you light weight 2 yarn and let’s get started! It’s light, comfy, and a fun summer dress! 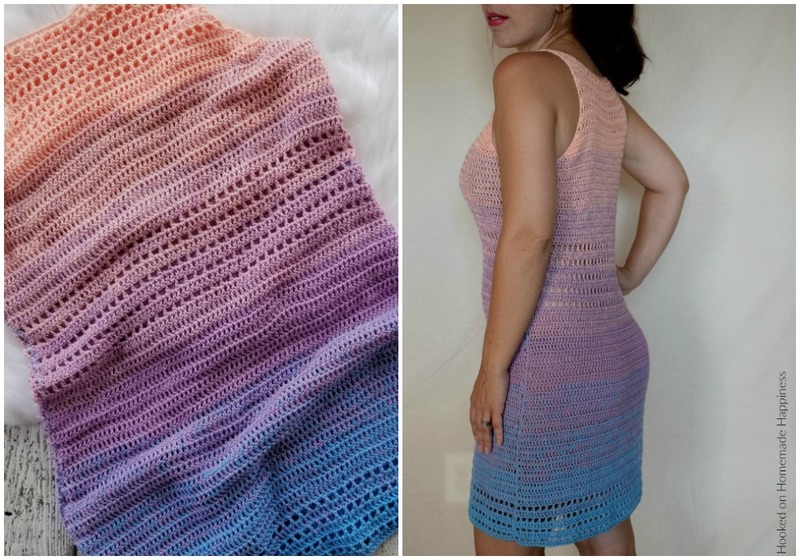 Trust me when I say, you won’t get too hot in this crocheted dress. Not only is the yarn a cotton/acrylic blend, but the entire dress (size small) is just 200 g of yarn! Whattttt?? 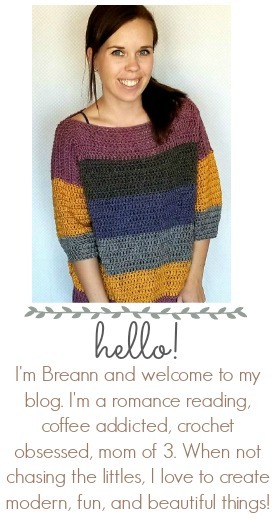 I used Lion Brand Ombre Life in Sunrise for this project (you can find this yarn HERE). 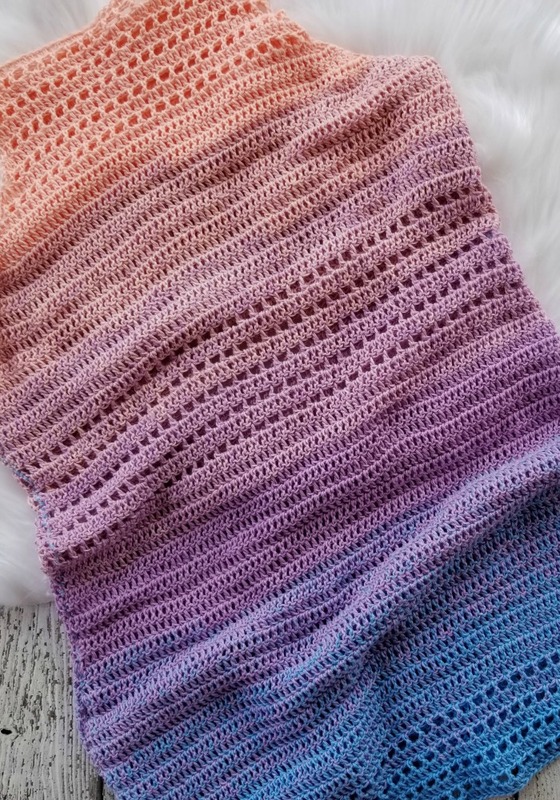 I am IN LOVE with the color changes in this yarn! They are so seamless and the ombre effect is perfection. 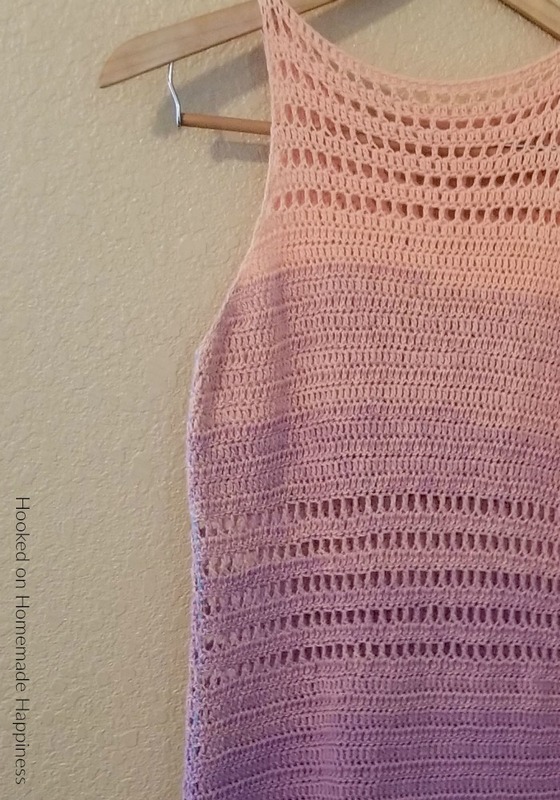 For a size small I used 2 skeins, you’ll need 3 for a M, or L. If you’re using 3 skeins or Ombre Life, I would deconstruct the last skein so that when you add it it to your dress you’re still working with the same color. This will keep up the ombre effect. Dress is made with two panels sewn together. Each made from the top down. Fasten off, leave a (really) long end for sewing. Using the long starting end, sew the shoulders closed with a whip stitch across 3 stitches on each side. And that’s it!! I hope you love this flirty summer dress! Here’s my question: row eight after you double crochet three in the last stitch, turn your work and do row 2 where exactly do you start the row two? In one of the three double crochet in the last stitch you just did? Or??? Here’s my question:is this made from the top down? Or from the bottom up? So do you turn at each ending row? Or no you do not turn? Hi! I measured it, but I don’t think it’s going to match yours because I have a blocked piece and it has stretched since it’s been worn. Sorry! Here’s another question: do you have any pictures of row one to row 26? So I can see what it is supposed to look like? At this point, it seems my arrow side areas would wrap around past my sides? Should not we have decreased at some point?so I did check gauge. it appears x amount of rows was 4 inches and17. Double crochet were also 4 inches. So it appears I am making a medium size as I have the required 89 count across in each row. Hi! If you’re matching gauge, then at row 26 it should be about 16.5″ across (for a S) and should be straight across. Should it measure that across from side to side? What should it measure from top down to row 26? I have not seen any chain stitches yet? In the pattern? Yes, the measurements are from side to side. I don’t have the measurements from when I was making it. Me dress has been blocked and stretch, so if I were to measure from the top to row 26 it would not match up to yours. The chs in row 2 should tighten up the waist measurements. Lol! I at this point have finished row 28. And you know your summer halter top? Well I can wrap the lower sides of row 28, all the way to the middle of my back the tips of row 28 can just touch each other! Lol!! !only made up to row 28 of first piece. could you please please send me some patterns and send me your newletter.